Involvement in sports is a wonderful physical activity, whether you are a child or an adult. While sports are great fun, there are many types, including football, soccer, lacrosse, and martial arts, that can pose a risk for serious injuries. These injuries can also include facial injuries that can affect your teeth and your jaw. Wearing the appropriate protective gear is essential for injury prevention. To protect your mouth, a sports guard is crucial. The Elmwood Dental Group LLC can help with a professionally made sports guard. • Falls on the field. • Coming into contact with other players. • Getting hit with a ball or other equipment, such as a hockey stick or lacrosse stick. There are a few different types of sports guards available. • Stock. Stock sports guards are the cheapest type available and can be found at any sporting goods store. These guards are pre-molded. While affordable, they do not often provide ideal protection for everyone. Moreover, if your sports guard does not fit properly, it can increase your risk for oral injuries and can interfere with breathing. • Boil and bite. A boil and bite sports guard is another widely available option found at sporting goods stores. This sports guard provides a semi-custom fit. It is made to be dropped into boiling water for a short time and then cooled slightly before you bite into it. If you do not achieve a proper fit the first time, you can reheat it and try again. • Custom. We provide custom fit sports guards. While these types of guards are the most expensive, they also provide the best protection. They are made from impressions of your mouth, ensuring an accurate fit. We use the highest quality materials to ensure that they provide optimal protection and last a long time. Sports guards require proper care for them to provide optimal protection. Rinse them under water before and after each use. They should be periodically cleaned with soap and water. You can also use your toothbrush and toothpaste. When you are not using your sports guard, it should be stored in a protective case. The case should have ventilation holes for airflow to prevent bacterial growth. It should also be stored in a safe location, away from small children and curious pets. 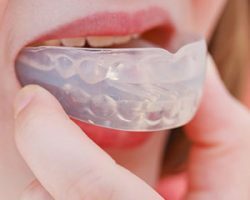 Do not store your mouth guard in a car or leave it exposed to heat or sunlight for long periods of time. Heat and sun can decrease its effectiveness. Periodically inspect your sports guard for signs of damage. At the first sign of damage, no matter how minor, the sports guard should be replaced. ;Tooth protection. Your teeth are protected from cracks and chips. They are also protected from becoming dislodged or knocked out. ;Soft tissue protection. Your intraoral tissues are protected from lacerations, which can damage blood vessels, nerves, and salivary glands and ducts. With a properly fitting sports guard, your mouth can be protected from serious injuries while you participate in the sporting activities you love most. For more information, and for your custom created sports guard, call The Elmwood Dental Group LLC at (860) 331-8748 today.